Bought my first bike on Saturday! It is a 2002 Yamaha V-Star with 1600 miles on it. I got in a little practice at a parking lot yesterday afternoon and can't wait to get back on it. My BF was impressed with how much I had learned in the motorcycle safety course. If I can just remember everything. I have the same bike in black and LOVE it! Mine is the 1100. I do not have hardbags yet but it's on my list of demands. Enjoy! I wish you many years of trouble free riding! Congratulations on passing the course and on your new bike. I took the course in July and about 2 weeks ago, I bought my first bike. It's an '03 Yamaha V-Star 650. It's the perfect starter bike for me and I'm loving every minute on it! 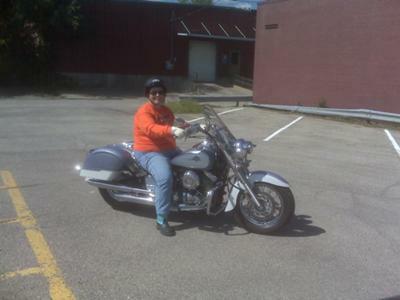 Joan, congratulations on getting your first bike and passing your MSF course. I still do some parking lot practice as I'm trying to get more comfortable with the slow turns and that figure 8 that everyone loves :0) Keep up the good work!